In this seventh archive story by Kristian Bertel, we have an encounter with a sleeping man in Delhi, India. Nothing can fully prepare you for India, but perhaps the one thing that best encaptulates this extraordinary country is its ability to inspire, frustrate, thrill and confound all at once. India is a one of the world's most multidimensional countries, presenting a wildly diverse spectrum of travel encounters. 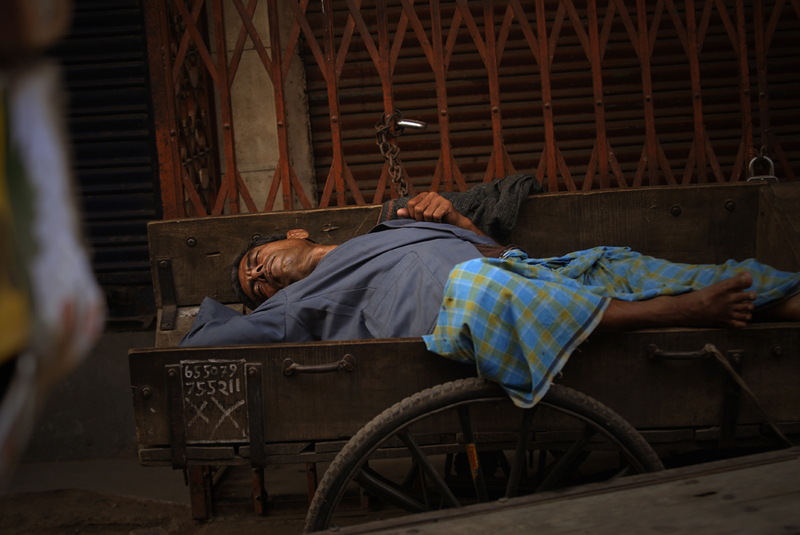 In this photo an Indian laborer is sleeping on a hand-pulled cart used to transport heavy materials in Delhi, India. Through the many streets in Delhi you can easily find Delhi as a melting pot. You will hear a jumble of vernaculars spoken in Delhi, the most common being Hindi, English, Punjabi and Urdu. In terms of its layout Delhi encaptulates two very different worlds, the 'old' and the 'new', each presenting deliciously different experiences. As you see in the picture above the man is sitting on a hand-pulled cart which is made of wood. Hand-pulled carts are a part of the pulled rickshaws which is a mode of human-powered transport by which a runner draws a two-wheeled cart which seats one or two people. In recent times the use of human-powered rickshaws has been discouraged or outlawed in many countries due to concern for the welfare of rickshaw workers. Pulled rickshaws have been replaced mainly by cycle rickshaw and auto rickshaws. The photographer took the portrait of the sleeping man in Delhi. The sleeping man and worker is part of the unorganised sector in India. Over ninetyfour percent of India's working population is part of the unorganised sector. In local terms, organised sector or formal sector in India refers to licensed organisations, that is, those who are registered and pay sales tax, income tax and so on. These include the publicly traded companies, incorporated or formally registered entities, corporations, factories, shopping malls, hotels, and large businesses. Unorganised sector, also known as informal sector or own account enterprises, refers to all unlicensed, self-employed or unregistered economic activity such as owner manned general stores, handicrafts and handloom workers, rural traders, farmers and so on. India's has classified the unorganised labor in India into four groups. This classification categorized India's unorganised labor force by occupation, nature of employment, specially distressed categories and service categories. The unorganised occupational groups include small and marginal farmers, landless agricultural labourers, share croppers, fishermen, those engaged in animal husbandry, beedi rolling, labeling and packing, building and construction workers, leather workers, weavers, artisans, salt workers, workers in brick kilns and stone quarries, workers in saw mills, and workers in oil mills. A separate category based on nature of employment includes attached agricultural labourers, bonded labourers, migrant workers, contract and casual labourers. Another separate category dedicated to distressed unorganised sector includes toddy tappers, scavengers, carriers of head loads, drivers of animal driven vehicles, loaders and unloaders. The last unorganised labour category includes service workers such as midwives, domestic workers, barbers, vegetable and fruit vendors, newspaper vendors, pavement vendors, hand cart operators and the unorganised retails. India is a land full of stories. On every street, on every corner and in the many places in India, life is rushing by you as a photographer with millions of stories to be told. In the archive story above, you hopefully had a readable insight in the story that was behind the photo of a sleeping man in Delhi. On this website of Kristian Bertel | Photography you can find numerous travel pictures from the photographer. Stories and moments that tell the travel stories of how the photographer captured the specific scene that you see in the picture. The photographer's images have a story behind them, images that all are taken from around India throughout his photo journeys. The archive stories delve into Kristian's personal archive to reveal never-before-seen, including portraits and landscapes beautifully produced snapshots from various travel assignments. The archive is so-far organized into photo stories, this one included, each brought to life by narrative text and full-color photos. Together, these fascinating stories tell a story about the life in India. India, the motherland to many people around the world, a land of unforgetable travel moments. The archive takes viewers on a spectacular visual journey through some of the most stunning photographs to be found in the photographer's archive collection. The photographer culled the images to reflect the many variations on the universal theme of beauty and everyday life in India. By adding these back stories the photographer's work might immensely enhanced the understanding of the photographs.